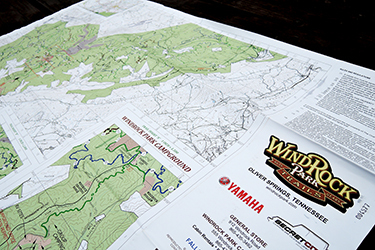 The Windrock brochure boasts that it’s the South’s Largest Off-Road Park, and that’s probably right. 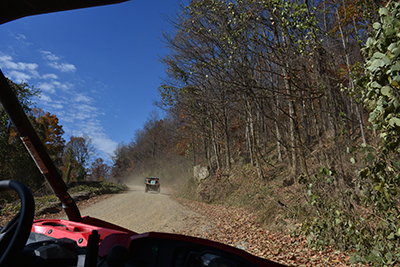 Windrock has over 72,000 acres and 300 miles of ATV trails spread out over several mountains. We came here with our tricked-out four-wheeler to compete in the Black Death Cliff Event. It’s a whole afternoon of throttle-wide-open jumping and we came in second place. Just kidding! 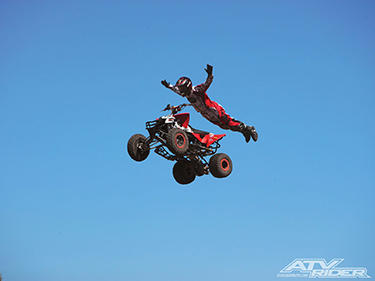 There’s no Black Death Event and no way we’d jump off a cliff with an ATV! 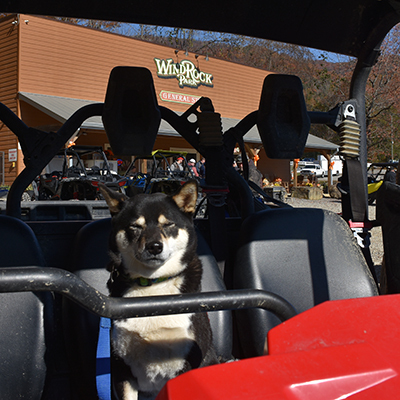 But we did rent a four-wheeler to drive around Windrock for a day – at a nice slow geezer speed with the seat belts fastened. 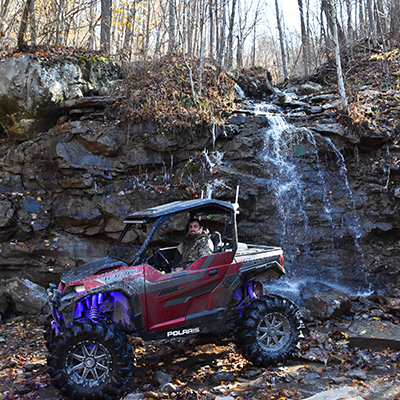 This Off-Road paradise is way up in the Cumberland Mountains of eastern Tennessee. 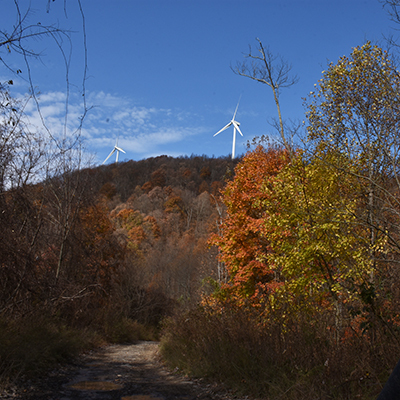 Windrock Park used to be a mining operation and the land was reclaimed as a recreation area. 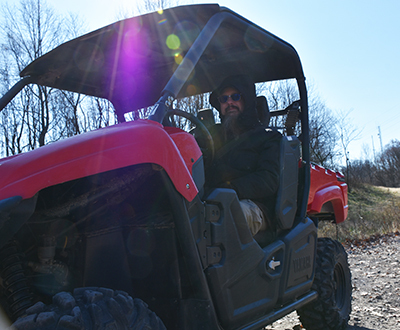 Most folks bring their own ATVs to ride the 300 miles of trails here. We opted to rent a SXS (Side By Side) from the Windrock fleet. The cost wasn’t too bad, about $200 for the day plus a required Land Use Permit that runs around $17 per person. And yes, they do check your permit at the trailhead. A giant map of the property is available at the General Store and it’s worth the $5 because it’d be pretty easy to get lost back here. While the trail numbers are well marked, the property is so vast that you could ride around for days and never repeat the same trail twice. We stayed on the easy trails, marked with a G for Gravel Road. We gingerly picked our way up and down some pretty steep paths that had little to do with either gravel or road. Our rental agreement specified we absolutely could not ride on the Black Diamond Difficult trails – they were boulder-strewn cliffs and I can assure you we had no desire to plummet down them! So the easy trails didn’t cramp our style at all. 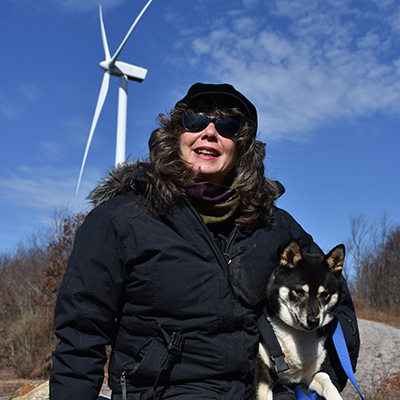 There’s several power generating wind turbines at the top of the mountain and they make an interesting whooshing hum when in motion. That’s the closest I’ve ever been to a wind turbine, near enough to hear it. 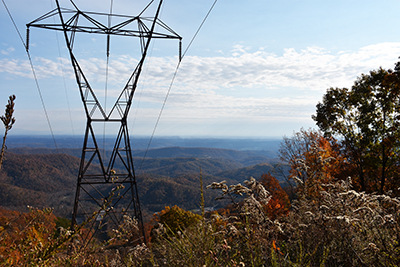 Some of the mountainsides had power line cut-throughs to those wind mills, which opened up vast vistas of the valley below. 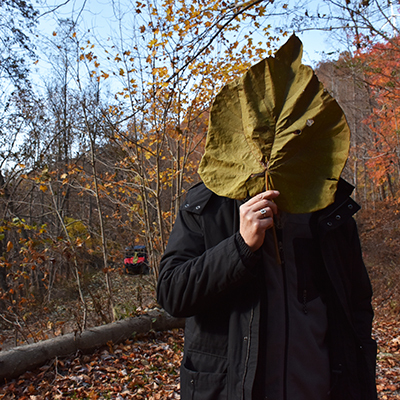 The rest of Windrock Park is heavily forested, you drive around steep trails through the thick woods. 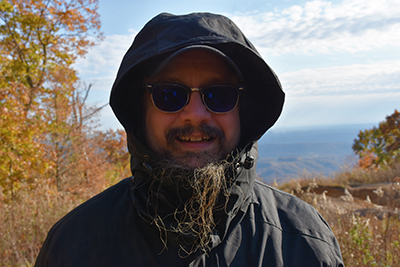 It was a pretty day out on the trails, but quite chilly. It gets cold up on those mountains and our rental vehicle didn’t have a windshield so the brisk air was right in our face. 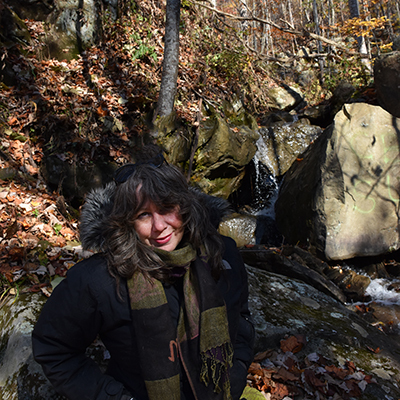 We stopped at a picnic pavilion near a babbling waterfall to have lunch and warm up in the sunshine. 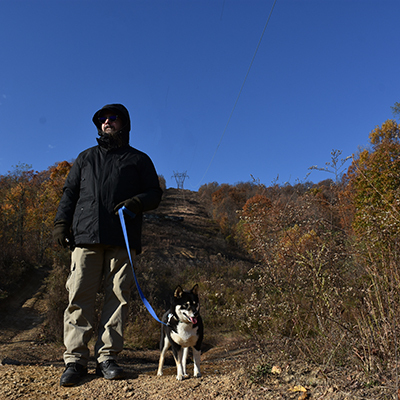 Windrock is lenient about what you can bring up here – coolers and dogs are okay, but alcohol is strictly forbidden. This place is dangerous enough without a bunch of drunk yahoos running you off the edge. Little streams cross many of the trails and there are big mud wallows you have to splash across. 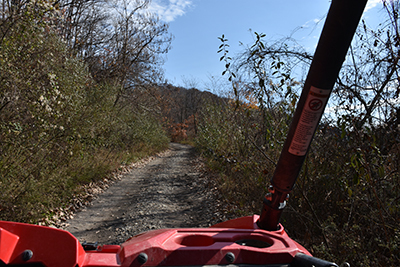 Whether you go slow or fast, your ATV is going to be covered in mud, so Windrock thoughtfully provides power washing stations at both the trailhead and the campground to hose down your rig. We spent about 5 hours on the mountain, bumping along in the chilly air. We rode only a small fraction of the trails and mostly had the place to ourselves. There were lots of other folks riding the trails that day, but the park is so big that people dispersed pretty quickly to other sections. 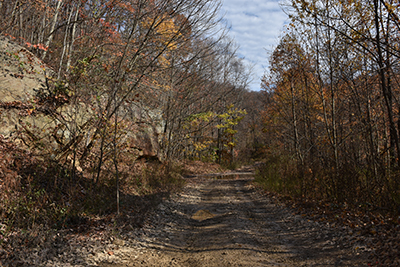 We stayed at Windrock Park’s campground which was convenient to the trails. The nice folks at the General Store came to fetch us at the campground because it was a 2.5 mile walk to the trailhead. Our excuse was that we were loaded up with coolers, camera bags, and a dog for our day on the trails, but in truth we didn’t walk because we’re pretty lazy and it was really nippy! 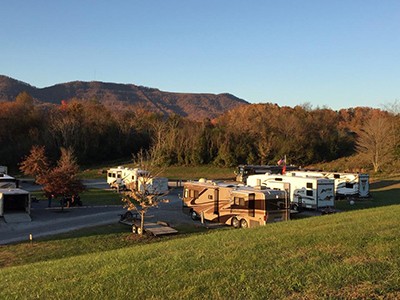 If you want to come ride around Windrock there are many lodging choices here, from campgrounds to cabin rentals and hotels. 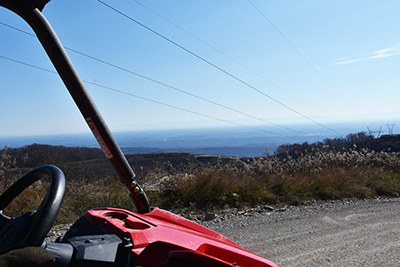 Bring your ATV, off road Jeep, dirt bike or mountain cycle. Or rent one here. Just watch out for the cliffs and slow moving geezers! Such a cool park! This looks like a lot of fun! Big Adventurers for sure!!! Mike would jump those cliffs for sure! I have to admit you had me going in the beginning because you guys are the real adventurerS!!! Again I would love to go hear to one day ! Sounds like an awesome way to spend the day . Lol – I wish I was brave enough to cliff jump! Riding tame was fun enough, tho!